Loper OS » Phuctor: Fun with Public-key Cryptography. Phuctor Example: my current GPG key. Edit: Feel free to post bug reports as comments under this post. But keep in mind that reports without an accompanying pubkey (the one which triggered said bug) aren’t particularly helpful. This entry was written by Stanislav , posted on Saturday October 19 2013 , filed under Cold Air, Computation, Cryptography, Distractions, Idea, NonLoper . Bookmark the permalink . Post a comment below or leave a trackback: Trackback URL. It would be nice if the site told you what command to run to get the key in the needed format. Use the same format your public key is in when you give it to people. That is, “ASCII armored.” See the manual. Did something change in the required format? 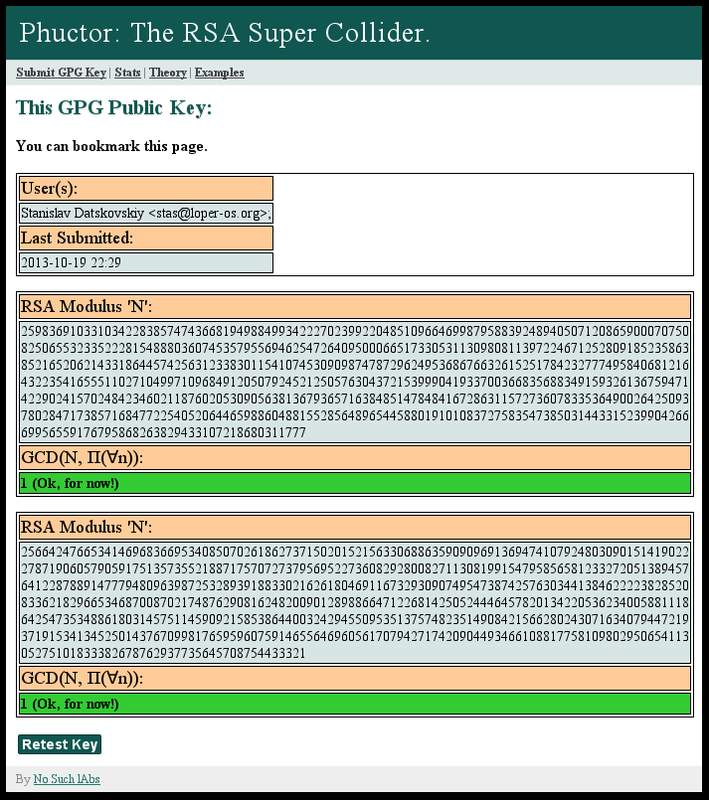 Error: Was that really a GPG public key? Try again. Also make sure it is in a standard “ASCII-armored” form, with no extra line breaks or garbage mixed in. If a stock GPG client won’t swallow it, neither will Phuctor. This one appears to have non-UTF-8 junk in the username field. Genuine bug! Thank you. Sorry for taking so long to respond, forgot to look back. non-UTF8? I’m 90% certain that there isn’t, but feel free to prove me wrong. first of all let me take the opportunity and thank you for the website which I have been reading for a long while. With regards to the GPG supercollider, I have tried a number of submissions, also including some random people found on pgp.mit.edu and they all went through (occasionally I got the “does not contain RSA modules”, fair enough). But this one keeps giving me the error. I wonder if Roger has the same problem? Maybe it is not the format he has wrong. Maybe we have a conceptual error, I for one am ignorant in criptography and trying to learn a little bit. I apologize if it is very stupid question…. i think not asking and remaining ignorant would be stupider. The routine that checks for keys having no RSA moduli should have picked this fact up, rather than spewing a generic “this key is garbage”. I’ll check on it. Hi Stanislav. Have you considered contacting one of the MIT keyservers and requesting a dump? If you can prove it is for research purposes and you are not a spammer then I imagine they will assist you. It would certainly give you a large sample size to assess. Public keys being, well, public – we’ll get them one way or another. Various people are helpfully working on making it happen. I know they are public but out of courtesy to the site owners who may not want the whole world grabbing dumps see below... I may have a source for the entire MIT dump too if you give me some time. Oops, hit encrypt prematurely before adding another dump location that has 4+GB of keys. Please check the first link. All I get is a few kb of checksum. Getting a 404 on this one. No problems. My apologies for spamming your blog with crap. Feel free to remove those old posts! I would have sent it in the clear but didn’t want to step on anyone’s toes nor aggravate the key server ops into restricting access or putting a .htpasswd on the area. I am severely jet lagged and have moved well past the tired stage and into the strangely stimulated zone where your concentration is shot and a decent sleep appears to be out of the question. Let me know how your project goes! Hey Stanislav. I mentioned your phuctor project on my blog the other day, even managed to troll a response out of Mr. Popescu . A few quick questions. I realize some of this may be commercial in confidence so feel free to neglect to respond to anything which might be an issue or respond privately (my key is on the link above). I hope you managed to get that keydump. How are you planning on importing this information? Just a script that pumps it into your software one by one until the job is done. I suggest that once you have imported that dump you keep your site updated. You can do this in one of two ways the first is to run your own SKS type key server and let it use the “gossip” protocol to keep it up to date but this is a lot of hassle for no real payoff. The second way is much easier. Depending on what keyserver software the URL I gave you is running the behavior may be different but I will outline what should work. The SKS software dumps keys into an archive at a rate of 15000 per archive. The complete dump you downloaded was up to sequence number 0228. The individual dump archives begins to get uploaded on at 1000 UTC every Sunday. The individual dump files are finished by 1200. The 4+GB tarball of everything is ready at 1500Z (times rounded to be conservative). My suggestion is once you have put the big tarball into your collection you run a script from cron at any time after 1200Z on Sunday to do your import routine. You are currently up to sequence 0228. Unless the way the software operates has changed since I last played with it you will need to refetch this archive and any other files with a sequence number greater than that. Your script needs only simple logic. Keep the current sequence in a file. If there exists seq+1 then download both seq and seq+1, then increment your counter on successful processing. You need to process the last one as it will be filled up to 15000 before making a new file, so it won’t be the same as last week’s file of the same number. If seq doesn’t exist or seq has jumped more than seq+1 then error out (keydumps should never go backwards nor should there be more than a file added in a week, typically only a few keys change every week). You will want to keep track of the keyID’s to avoid reprocessing keys you already looked at the week before. My knowledge is somewhat dated with regards to keydumps but it used to be that new data was always appended to the end, that is to say that the older files that are already at 15000 are never retrospectively modified. This makes sense but if the behavior has changed since I last played about five years back you will probably want to use rsync to avoid moving files that haven’t changed and keep track of keyids so you don’t waste processing time on rechecking keys that are already in your database. The site I gave you has anonymous rsync available. The format of the keydump chunk files are sks-dump-SSSS.pgp.bz2 and are in the same directory as the big dump. SSSS is the four digit sequence number. Where number is less than four digits it is zero padded so we are at 0228 right now. 0228 will continue to grow until it hits 0228 and then 0229 will be generated. Hope this info helps. I did a research project a while back with PGP keys, determining likely fraud (or lost keys) by tracking people with numerous keys signed by differing parties but with the same name and email address. Using the sequence files is nicer on the keyserver than pulling down a massive tarball every week. So now for the questions! 1. It would seem very useful (for research purposes) to keep a log of weak keys and the modulo shared. I realize there are privacy implications linked to them and you likely don’t want to leave it lying around on a web server where a 0day might result in the weak key list being leaked. Nonetheless it is great research and you may actually be able to sell the data (for a nominal fee) to a IT sec research group if they want to do an analysis. Perhaps you can generate a keypair and keep it offline somewhere and then have your processing script for phuctor when it encounters a weak key to log the keyIDs and data then encrypt it to the well secured key and add it to your weak key log. 2. How long is it taking phuctor to process the average (1024R) key, rip it apart, determine the modulo and query the database to determine if others share the keys. 3. You mention that if bad keys are found the user is notified and the key is deleted. Does this mean that both (or more) parties are notified and all keys removed? perhaps you can update us on this blog when the 4GB tarball has been fed and digested by the algorythm? I also would like to ask why you do not ask the machine (processor, OS) where the keys were generated. The donated keys will be fed in piecemeal, at least until we get a hardware upgrade. At present I’ve been rather busy with other matters. The interface is strictly minimal, asking only for a key, to make automated submission easier. Besides, the expectation is that most of the keys one submits belong to other people. Have you considered collecting the public keys used by CryptoLocker? Right now we have a plentiful supply of keys to throw in the hopper, but a not-so-plentiful one of CPU cycles. This will change. Perhaps you could do this in a distributed manner. If the key checking becomes a commercial venture (where people submit keys to be checked for a small fee) you could even pay people fractions of satoshis per key processed. No doubt people have PCs sitting around with idle cycles that could be used for this process. Obviously you would need a way to synchronize the list of products between machines but this shouldn’t be too much of a headache – well it will grow quickly I suppose. I may have access to something a bit more suitable to your project, 1.5 petaflops. I know that some students at our local university used to do weather modelling on it and it was made available essentially for free. I might be able to inquire about pricing – as far as I know it is practically idle and is only occasionally used for education. 101 xor 16 = ?